The use of heavy metals and their compounds in industrial applications has resulted in their occurrence in various environmental media including water bodies. Conventional methods of heavy metal removal from wastewaters are very expensive, when available, especially in developing countries. This study therefore assessed the potential of sugarcane biomass to remove zinc from standard solutions and industrial (paint and textile) wastewaters. Parameters studied include contact time, biomass weight, metal concentration, pH, agitation, temperature and particle size. Physico-chemical characteristics of biomass were also studied. 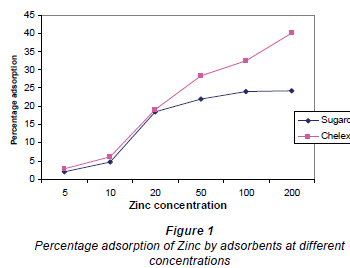 Adsorption of zinc increased with increases in contact time, biomass weight, pH and agitation speed, while adsorption decreased with increasing particle size and for temperatures above 50ÂºC. Sugarcane biomass was responsible for over 90% adsorption of Zn2+ in both effluents. Under conditions of agitation, 100% adsorption was achieved. Percentage ash, particle density, cation exchange capacity (CEC) and porosity are important physico-chemical properties which influenced Zn2+ adsorption. Percentage ash and CEC are positively correlated to percentage adsorption while particle density and porosity are negatively correlated. Percentage desorption was over 90 for both effluents. Sugarcane biomass is therefore a potential alternative to expensive synthetic resins. Its biodegradability makes disposal environmentally friendly. However, there is the need to further study the biomass in flow-through systems for industrial applicability. Keywords: Zinc, sugarcane biomass, wastewaters, remediation. The presence of heavy metals in the environment is a potential problem to soil and water quality due to their high toxicity to plants, animals and human life (Fonseca et al., 2006). Heavy metals have been reported to be carcinogenic (Krishnani et al., 2008); apart from being hazardous to living organisms when specific limits are exceeded, they also have accumulating tendencies, unlike organic pollutants that can be degraded chemically or biodegraded (Cossich et al., 2002; Veli and Alyuz, 2007; Fonseca et al., 2006). The increased use of these metals in the process industries has resulted in the generation of large quantities of aqueous effluents that contain high levels of heavy metals (Antunes et al., 2003). The main industrial sources of heavy metals in water resources include electroplating, chemical, metal-finishing and wood preservatives (Aziz et al., 2008; Peric et al., 2004). Recently, water and wastewater contamination by toxic metals has become a global environmental concern (Ahmady-Asbchin et al., 2008) because of consequent interference with many beneficial uses of water (Aziz et al., 2008). This has led to the enactment of laws worldwide setting discharge limits of these metals from industrial effluents (Ulmanu et al., 2003; Krishnani et al., 2008). Conventional methods for heavy metal removal from waters include electrodialysis, chemical precipitation, ultrafiltration, reverse osmosis, etc. (Ahmady-Asbchin et al., 2008; Stirk and Staden, 2000; Peric et al., 2004). The removal of toxic metals from water is a difficult task due to low availability and high cost of conventional treatment methods (Horsfall and Spiff, 2004; Krishnani et al., 2008), especially in developing countries. Since most conventional methods are neither effective nor economical, especially when used for the reduction of heavy metal ions to low concentrations, new separation methods are required to reduce heavy metal concentrations to environmentally acceptable levels at affordable cost. Biosorption has the potential to contribute to the achievement of this goal (Klimmek et al., 2001; Al-Asheh and Duvnjak, 1999).The term biosorption is used to describe the passive non- metabolically mediated process of metal binding to living or dead biomass (Rangsayatorn et al., 2002). It is a rapid, economical, effective and eco-friendly techonology, in contrast to expensive conventional methods (Nouri et al., 2007; Krishnani et al., 2008). A variety of low-cost biomass has been investigated for controlling pollution from diverse sources in different parts of the world (Kar and Misra, 2004). These include anaerobically digested sludge (Tokcaer and Yetis, 2006), bacteria (Lu et al., 2006), fungi (Garcia et al., 2005) and algae (Elifantz and Tel-Or, 2002). Agricultural materials have also been used. These include rice bran, soybean and cottonseed hulls (Marshall and Johns, 1996), crop milling waste (Saeed et al., 2005), groundnut husk (Okieimen et al., 1985), maize cob meal (Okieimen and Okundaye, 1989), coir, jute and sawdust (Shukla and Pai, 2005), canola meal (Al-Asheh and Duvnjak, 1999), and coconut shell (Ogunsuyi et al., 2001), amongst others. Zinc (Zn2+), one of the heavy metals on the US Environmental Protection Agency (USEPA) priority pollutant list has been indicated in serious poisoning cases (Veli and Alyuz, 2007). Symptoms of Zn2+ include dehydration, electrolyte imbalance, stomach ache, nausea, dizziness and muscular incoordination. It is widely used in coating iron and other metals, in wood preservatives, photographic paper, accelerators for rubber vulcanization, ceramics, textiles, pigments and batteries (Lu et al., 2007). In some countries, sugar cane is considered as a type of fruit, in which the stem is chewed or used to extract the fresh juice. Sugar cane is a highly versatile plant, and can be grown successfully under a wide range of conditions. The by-products of sugar manufacture (molasses, bagasse and filter mud) are used in many ways, including food, as well as the basic raw material for the burgeoning sucro-chemical industry (Blackburn, 1991). In Nigeria, sugarcane fibre is usually discarded, and presently there is no known use for this residue in the country. The objective of this work was therefore to investigate the ability of sugarcane biomass to remove Zn2+ from aqueous matrices, as well as its desorption and re-use potentials. All chemicals used were of analytical grade. A 1 000 mg/ℓ stock solution of Zn2+ was prepared from ZnCl2 (Merck, Germany). Standard Zn2+ solutions in the range 5-200 mg/ℓ were then prepared from stock solution; the synthetic resin used was chelex (Bio-Rad, France). Batch samples of sugarcane fibre were collected as waste materials from dumps. The fibres were cut into smaller sizes, thoroughly washed, first with tap water and then distilled deionised water, and then oven-dried at 90ÂºC for 48 h. The dried samples were then ground using a wooden mortar, sieved using 100, 200, 500 and 2 000 mesh screens. These particle size fractions of the biomass were washed twice with 0.01 M HCl to remove any metals or debris that might be in the biomass prior to experimental metal ion exposure. The acid-washed biomass samples were again washed twice with distilled deionised water to remove acid, and then oven-dried at 70ÂºC for 48 h. This pretreated biomass was then stored in plastic containers at room temperature for further experimentation (Khan and Wahab, 2007). Batch samples of paint and textile effluents were collected from points of discharge of effluents into the environment at Ikeja Industrial Estate, Lagos, Nigeria, and their pH immediately determined using a pH meter (Jenway Ltd., Dunmow Essex, England, model 3015). Zn2+ concentration was measured using the Alpha 4 Atomic Absorption Spectrophotometer (Chemtech Analytical, UK). Equilibrium conditions of adsorbent weight (capacity studies), contact time (kinetics), pH and adsorbate (Zn2+) concentrations (equilibrium isotherm), temperature, particle size and agitation speed were studied using Zn2+ standard solutions and industrial (textile and paint) effluents (Opeolu et al., 2009). Kinetic parameters for the adsorption process were studied for batch adsorption of 100 mg/ℓ Zn2+ at 32ÂºC. Six sets of a mixture of sugarcane biomass (0.4 g) in 25 mℓ of 100 mg/ℓ Zn2+ in 100 mℓ conical flasks were allowed to stand at different time intervals of 30, 60, 90, 120, 150 and 180 min, respectively, for adsorption to take place. The mixture was then filtered to separate the adsorbent and the filtrate to allow for analysis of residual Zn2+; thereafter, the percent removal of Zn2+ was measured (Kadirvelu and Namasivayam, 2003). 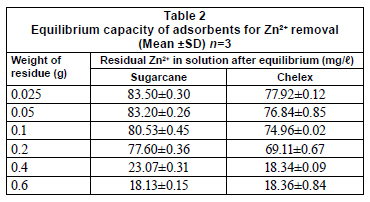 Different weights of each of the adsorbents (sugarcane biomass and chelex) in the range of 0.025 g to 0.6 g in 25 mℓ solution were used to remove Zn2+ from 100 mg/ℓ Zn2+ standard solution. A 25 mℓ aliquot of the Zn2+ solution was accurately measured into 100 mℓ conical flask and the adsorbent added to the flask; a contact time of 2 h was maintained for all the experiments. After 2 h contact time, the mixture was filtered through Whatman No 1 filter paper (medium flow rate and porosity with particle retention of 11µm) and the filtrate analysed for residual Zn2+ by AAS (Dakiky et al., 2002). The pH of 100 mg/ℓ Zn2+ solution prepared from 1 000 mg/ℓ stock solution was adjusted to the desired value and kept constant with the addition of either 0.1 M NaOH or 0.1 M HCl. The pH values investigated were 2, 4, 5, 7, 8 and 10. Sugarcane biomass (0.4 g) aliquot was weighed and added to 25 mℓ of 100 mg/ℓ Zn2+ solution at the desired pH and left for 2 h. The mixture was then filtered and the filtrate analysed for Zn2+. The procedure was repeated for each of the adsorbents and carried out in triplicate (Horsfall and Spiff, 2004). Zn2+ standard solutions with concentrations ranging from 5 mg/ℓ to 200 mg/ℓ were prepared from the stock solution. Adsorbent weight of 0.4 g in 25 mℓ solution was also used for adsorption isotherm studies with a contact period of 2 h (earlier established as equilibrium time or adsorption) after which the mixture was filtered for analysis for Zn2+(Goksungur et al., 2003). The experiment was repeated in triplicate for each adsorbent. Each of the adsorbents was weighed to determine the effects of shaking speeds. A 0.4 g aliquot of each of sugarcane biomass and chelex were weighed into a 25 mℓ solution of 100 mg/ℓ Zn2+ in a 100 mℓ conical flask. For each adsorbent, the mixtures were shaken in an orbital shaker (Edmund Buhler, GmbH & Co., Germany) at speeds in the range of 50 r/min to 300 r/min. After 30 min, the mixtures were filtered using Whatman No. 1 filter paper and filtrates analysed for Zn2+ content. Experiments were carried out in triplicate (Kok et al., 2001). To each adsorbent (0.4 g), 25mℓ of 100 mg/ℓ Zn2+ solution was equilibrated by shaking for 30 min at 250 r/min at different temperatures - 30ÂºC, 40ÂºC, 50ÂºC, 60ÂºC, 70ÂºC and 80ÂºC in a water bath (Techne Cambridge Ltd, Duxford Cambridge, England). These were centrifuged immediately at 2 500 r/min for 5 min and the supernatant decanted. The supernatants were then analysed for Zn2+ (Horsfall and Spiff, 2005a). 0.4 g of 100, 200, 500 and 2 000 mesh adsorbents were weighed and transferred to separate tubes; 25 mℓ of 100 mg/ℓ Zn2+ solution was then added to each tube and equilibrated by shaking for 30 min at 250 r/min. The mixture was centrifuged at 2 500 r/min for 5 min and the supernatant decanted and then used for the analysis of residual Zn2+ (Wankassi et al., 2005). Textile and paint effluents (pH values 3.93 and 4.56, respectively, at 30ÂºC at the point of discharge) were used for the experiment. For each effluent, 0.4 g each of the adsorbents were added to 25 mℓ of the effluent and left standing for 2 h. After 2 h, the mixtures were filtered and the filtrates analysed for Zn2+ (Opeolu et al., 2009). To examine whether the filter paper used during the test adsorbed or released Zn2+, filtered and unfiltered samples were compared. Filtered and unfiltered distilled-deionised water were analysed by AAS to determine if Zn2+ was leached from the filters. Samples of filtered and unfiltered 100 mg/ℓ Zn2+ solutions were also examined to determine whether the metal was retained by the filters. Each sample was analysed in triplicate by AAS and a mean concentration was calculated. The relative standard deviation (RSD) for each sample was calculated as the standard deviation of the samples divided by the average of the samples. The value was multiplied by 100 to express it on a per cent basis (Brown et al., 2000). Standard solutions of Zn2+ were prepared from 1 000 mg/ℓ stock solution. These were analysed for Zn2+ concentrations; the results were used to plot the calibration curve to determine the linearity of concentration with absorbance. The detection limit of the instrument was also determined. Seven distilled-deionised water blanks were analysed for metals. Detection limit was evaluated as thrice the standard deviation of 7 blanks (Opeolu et al., 2009). Results of quality assurance samples showed that Zn2+ was not present in the distilled- deionised water used, did not leach from filter paper and was not adsorbed/leached appreciably onto/from filter paper, and the difference in value for the prepared solution and result was statistically insignificant. The relative standard deviation of 7 blanks was less than 15% and the R2 value of the calibration curve was > 0.99. Results of the effects of contact time on adsorption of metals are presented in Table 1. Results obtained in this study showed that optimal adsorption was achieved in 2 h, though adsorption increased with increased contact time. Subsequent adsorption experiments were therefore carried out at the optimal contact time for the respective metals unless otherwise stated. This is inconsistent with the findings of Veli and Alyuz (2007), who reported an optimal time of 5 min for Zn2+ when natural clay was used as adsorbent. Adsorption rate constant (Kad), which was calculated using Lagergren's equation (which is the most widely used sorption equation), followed a second-order mechanism for sugarcane biomass. Values were comparable to those reported by Kadirvelu and Namasivayam (2003), Ilhan et al. (2004) and Shukla and Pai (2005). It is necessary to consider the importance of adsorption kinetics on economic viability of a potential biosorbent (Stirk and Staden, 2000). One of the factors that would influence chemical combination of metal ions with active groups on the substrate includes the substrate-metal ion contact period and adsorption rate (Brown et al., 2000; Okieimen et al., 1985). Results of adsorption capacity of sugarcane biomass are presented in Table 2. Results showed that increases in the amount of biomass resulted in increased percentage adsorption of Zn2+. There were significant differences in percentage adsorption for different weights. These results are similar to those reported by Kok et al. (2001), Addour et al. (1999), Nomanbhay and Palanisamy (2005) and Mahvi et al. (2005). These authors explained that increasing adsorption with adsorbent weight can be attributed to increased number of unsaturated active sites as well as high accessibility of metals to the binding sites. The amount of adsorbent used is an important factor in Zn2+ removal from solution. The variation in sorption capacities between the different adsorbents may be ascribed to the available surface groups responsible for interaction with the metal ions. However, the presence of a functional group does not necessarily guarantee its accessibility as a sorption site, due to the possible co-existence of other types of barriers (Dakiky et al., 2002). Sugarcane biomass contains cellulose as a major component in its chemical structure. Shukla and Pai (2005) reported that cellulose has a 2-phase structure, the crystalline compact structure that cannot be penetrated and the amorphous open structure composed of surfaces, external as well as internal, which allow the adsorption of heavy metal cations. It is the pore size of a material which plays an important role in deciding the level of penetration of a chemical entity in the amorphous region, followed by its adsorption. This result is in contrast to that of Kar and Misra (2004), who observed that the increase in amount of keratin fibre (adsorbent) did not markedly affect metal uptake in batch tests, because of the probable presence of hydrophobic groups in the surface fibre. Also, Tsekova and Petrov (2002) have explained that biomass concentration has an inverse significant effect on biosorption. In a study in which Rhizopus delemar mycelia in free and polyurethane bound form was used, the amount of heavy metal adsorbed per unit weight was higher at lower biomass concentrations and decreased with increasing amounts of biomass. This contrasts with the result of this study in which increases in adsorbent weight increased percentage adsorption. Influence of initial metal concentration on percentage adsorption at equilibrium is presented in Fig. 1. Results that showed that Chelex, the synthetic resin, adsorbed Zn2+ better than sugarcane biomass from standard solutions of Zn2+. There were significant differences in percentage adsorption by the sugarcane biomass at different metal concentrations. Percentage adsorption for both adsorbents increased with increase in metal concentration. This is consistent with other studies that tested the effect of metal concentration on metal adsorption (Al-Asheh and Duvnjak, 1999; Tsekova and Petrov 2002; Al-Subu, 2002; Kok et al., 2001; Cossich et al., 2002; Vijayaraghavan et al., 2004; Klimmek et al., 2001; Ilhan et al., 2004). Adsorption increased to a certain level and continued until the adsorbent surface became saturated. The active biomass surface has the capacity to continue to adsorb metal ions in as much as the active sites are not fully saturated (Veli and Alyuz, 2007). Under high concentrations, apart from ion exchange, other mechanisms such as adsorption, chelation and micro-precipitation of Zn2+ have been reported to be responsible for enhancement of metal removal (Lu et al., 2007). The initial concentration also provides an important driving force to overcome all mass transfer resistances of solutes between the aqueous and solid phases. As mass transfer driving force increased, resistance to metal uptake decreased, resulting in higher metal removal (Nouri et al., 2007). Sorption characteristics revealed that surface saturation depended on initial metal concentrations. At higher concentrations, metal ions diffuse to the biomass surface by intra-particle diffusion in addition to adsorption on the surface sites (Horsfall and Spiff, 2005b). The magnitude of changes in metal ion binding capacity might also be due to metal properties such as ionic size, atomic weight or reduction potential. Adsorbent properties like structure, functional groups and surface area have all been reported as important parameters in metal uptake (Ozdemir et al., 2004). The results are, however, in contrast with those reported by Horsfall and Spiff (2004) and Goksungur et al. (2003). Both reported that initial metal ion concentration may not have any significant increase in adsorption. Horsfall et al. (2004) also reported that actual percentage removal of metal ions from solution decreased with increase in initial metal ion concentration. Freundlich and Langmuir isotherm models were used to adjust experimental data obtained for particular conditions. Isotherm parameters are presented in Table 3. The Langmuir isotherm model was used to evaluate the maximum adsorption capacity equivalent to complete monolayer coverage on the adsorbent's surface (Horsfall and Spiff, 2004). The sorption capacity, Xm, is greater for chelex, indicating greater ability for adsorption. K value, which suggests apparent energy of sorption is however greater for sugarcane biomass. 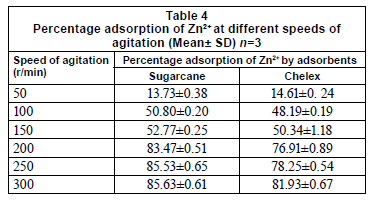 This implies that energy of adsorption is not very favourable for Zn2+ on sugarcane biomass; not all binding sites may therefore be available to Zn2+. The Freundlich model considers the existence of a multilayered structure (Cossich et al., 2002). Values of Kf and n, determined from the slope of Freundlich plots, were about unity, and this suggests favourable adsorption for the biomass. This agrees with Kadirvelu and Namasivayam (2000), who showed that n-values (which is sorption intensity indicator) between 1 and 10 represent beneficial adsorption. Coefficients of determination were also found to be highly positively correlated to sorption ability of adsorbents. By implication, significant adsorption may take place even at high metal concentrations. This is in line with Horsfall and Spiff's work (2005c) who reported 1/n values greater than unity for metal adsorption on fluted pumpkin waste biomass. The good fit of adsorption data to Freundlich isotherms may be attributed to the difference in the micro- and macro-structures of adsorbents. At higher concentrations in particular, saturation of the binding sites will occur and the formation of a multilayered structure will take place. Adsorption would therefore be random, due to existence of a distribution of energetically different active sites (Dakiky et al., 2002). Results of the influence of pH on adsorption are presented in Fig. 2; values reported are initial pH values and percentage adsorption at equilibrium. 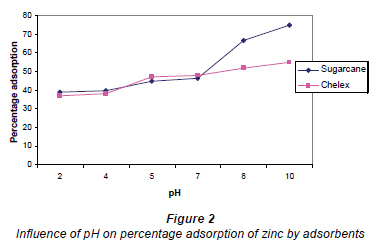 Adsorption was found to be dependent on the initial pH of the Zn2+ solution with adsorption increasing steadily with increase in pH until the optimal pH was reached. There were significant differences in adsorption capacity of sugarcane biomass at different pH values, at a confidence limit of 95%. 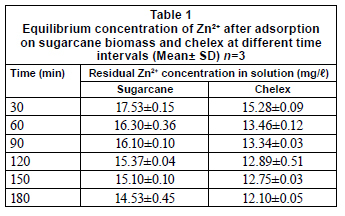 Sugarcane biomass also removed Zn2+ better than chelex with increasing pH values. The decrease in adsorption at low pH values is likely to be due to an increase in competition for adsorption sites by H+ (Horsfall and Spiff, 2004). The importance of pH cannot be over-emphasized in metal ion adsorption from aqueous solutions. This is because it affects the solubility of the metal ions, concentrations of the counter ions on the functional groups of the adsorbent and the degree of ionisation of the adsorbate during reaction (Nomanbhay and Palanisamy, 2005). Furthermore, adsorption was reported to depend on factors other than pH, which include flow rate, residence time, effects of dissolution of some other materials from adsorbents, amongst others (Shukla and Pai, 2005). This may explain the continued increase in adsorption of metals by biomass after pH 6, when precipitation of metals is expected to set in. The results of this study however vary slightly from the findings of Klimmek et al. (2001), who observed that the biosorption capacity for Pb2+ was constant over the pH range of 4-6 and reduced by only about 9% using a metal solution at pH 1. An increase in adsorption with pH has also been reported to be due to an increase of negatively-charged groups at the surface of adsorbents (Shukla and Pai, 2005). where M2+ in this case is Zn2+. The reaction produces monovalent M(OH)+ and protons with enhanced acidity of metal solutions, and if metal ions are being taken up by biomass, the reaction shifts to the left leading to the depletion of protons and hence a rise in pH. By contrast, if M(OH)+ species sorb onto the biomass, the above reaction shifts to the right and the solution becomes acidic. This explains the considerable removal of metals by sugarcane biomass. Zn2+ seems to interact with residues by complexation in addition to ion exchange. Binding behaviour is similar to the findings of Horsfall and Spiff (2004). These authors suggested that, to some extent, carboxyl groups (-COOH) may be responsible for the binding of Pb2+ and Cd2+, since the ionisation constant for a number of carboxyl groups ranges between 4 and 5. At lower pH the carboxyl groups retain their protons, reducing the probability of binding to any positively-charged ions. On the contrary, at higher pH (> 4.0), the carboxylate (-COO-) ligands attract positively-charged metal ions and binding occurs, indicating that the binding process is an ion exchange mechanism that involves an electrostatic interaction between the negatively-charged groups in the cell walls and the metallic cations. This may explain the increasing adsorption of metals at pH values above 5. Agitation rate has been reported to be an important parameter that is relevant for increased volumetric mass transfer of substances (Zarraa, 1995). In this study, percentage adsorption was greatly enhanced by shaking speed and optimal values were attained at 250 r/min and 300 r/min, in 30 min, for sugarcane biomass and chelex, respectively (Table 4). Sugarcane biomass had better adsorption potential under agitation than chelex. Percentage adsorption of metal ions was enhanced by shaking, both for the standard solution and the effluents. In the textile effluent, 100% adsorption was achieved in shaken experiments; adsorption by sugarcane biomass was significantly enhanced by shaking (p=0.05). For the paint effluent, sugarcane biomass also had 100% adsorption in the shaken experiment (Table 5). In both effluents, there were significant differences in metal adsorption by the biomass. Adsorption was greater in both effluents than in metals' standard solutions. Other workers have reported different metal uptake values from solutions under variable conditions with different materials as adsorbents (Mahvi et al., 2005; Ilhan et al., 2004). Various scientists have also reported trends of increased percentage adsorption, as reported in this study (Antunnes et al., 2003; Kadirvelu and Namasivayam, 2003; Engl and Kunz, 1995; Kar and Misra 2004; Ilhan et al., 2004; Mahvi et al., 2005). They established that atomic weight, adsorbent type, and different environmental factors such as pH and temperature are some of the parameters that influence metal uptake from solutions. Studies on the effects of temperature on Zn2+ adsorption are presented in Fig. 3. 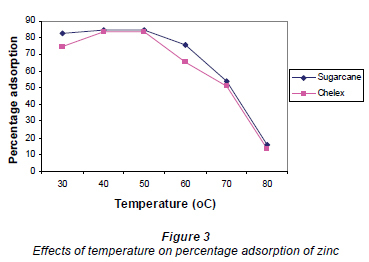 Results showed that optimal temperature for adsorption was 40ÂºC for both adsorbents. Increases in temperature above 50ÂºC resulted in reduced adsorption. High temperatures tend to decrease the boundary layer thickness; metal ions therefore had increased tendency to escape from the biomass surface to the solution phase. The decreased adsorption with increasing temperature also suggests weak adsorption interaction between biomass surface and the metal ion, which supports physiosorption (Horsfall and Spiff, 2005a). Results of the influence of particle size on adsorption are presented in Table 6. Results showed that the percentage adsorption increased with decrease in particle size of sugarcane biomass. CEC may be attributed to enhanced surface charge density which gives an overall intensity of charges on the solid matrix surface towards the sorption of metals in solution. This result agrees with Horsfall and Spiff (2004), who reported that an increase in surface charge density is an indication of enhanced sorption sites as a result of greater surface charges, indicating an ion exchange process between the adsorbent and the metal ion. This result is similar to that of previous studies (Kar and Misra, 2004; Shukla and Pai, 2005) which reported enhanced metal adsorption with decreasing particle size. Okieimen et al. (1991) also reported that rate of removal of Cd (II) and Pb (II) from aqueous solutions with EDTA-modified groundnut husk is particle-diffusion controlled (Kp is the rate coefficient for particle diffusion control corresponding to the particle size of the adsorbent). This seems to be due to increase in surface area and exposure of functional groups responsible for metal binding. This study however contrasts with the results reported by Addour et al. (1999) and Leusch et al. (1995) who demonstrated that the amount of metal uptake is directly proportional to the particle density. Khormaei et al. (2007) also reported that particle size of sour orange residue has no significant effect on final equilibrium concentration of copper, but decreased biosorption rate. Regression analysis showed that particle density and porosity are negatively correlated to percentage adsorption in textile effluent, and the former in particular is significant at 95% confidence level (Table 7). Particle density and porosity of adsorbents are important parameters for good adsorption in textile effluent. In standard solutions, CEC is an important parameter in adsorption; CEC contributes about 32.1% adsorption. At p = 0.05, significant differences occurred in CEC of sugarcane biomass. Correlation analysis however showed that CEC is positively correlated to percentage adsorption while particle density is negatively correlated. The positive correlation of percentage adsorption with CEC implies that the greater the value of CEC, the greater the extent of metal adsorption. The reverse is the case with particle density because it is negatively correlated with percentage adsorption. At the 0.01 probability level, particle density is negatively correlated to CEC and porosity. The implication of this finding is that for an adsorbent to be effective for metal removal from textile effluent it should be highly porous with small particle size; whereas, in paint effluent, adsorbents with high values of percentage ash will be desirable. 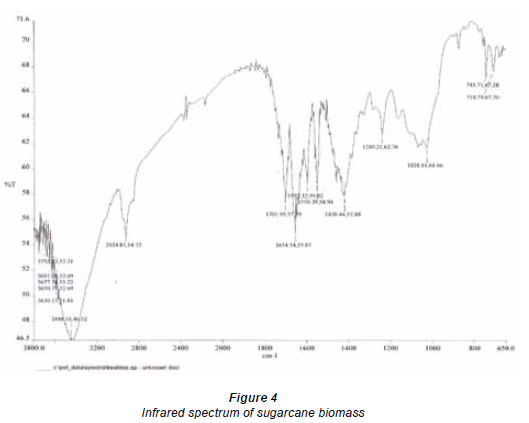 Although, surface area characterisation of sugarcane fibre was not conducted, the infrared (IR) spectra of the biomass revealed that several binding and chelating ions are responsible for Pb(II) uptake from solution. They include carbonyl, aldehydic, carboxylic, carboxylate, hydroxyl groups, amongst others (Fig. 4). Shukla and Pai (2005) reported that Pb (II) ions adsorbed on the hydroxyl groups of the cellulose component; hydroxyl groups of the material form strong covalent bonds with dyes and create sites for metal chelation and adsorption with dyed material. Carboxylic and carboxylate groups have also been identified as the main metal-sequestering functional ionic groups in the cell wall (Horsfall and Spiff, 2004; Leusch et al. 1995; Romero-Gonzalez et al., 2001; Yun et al., 2001). Periasamy and Namasivayam (1994) also stated that electrostatic forces as well as specific chemical interactions play important roles in metal adsorption. Mechanisms of metal uptake therefore include chemisorption in addition to physio-sorption. Over 99% of adsorbed Zn2+ from aqueous solutions and effluents was desorbed from sugarcane biomass. The result obtained agrees with Addour et al. (1999) and Gardea-Torresdey et al. (1996). who reported over 90% recovery of Zn2+ and Cu2+ from different adsorbents. This desorption is mainly ionic in nature, and hence weak enough to be easily leached out using a dilute acid. The result obtained is consistent with the findings of Horsfall et al. (2003), who reported 85% desorption of Cu2+ and Zn2+ ions from untreated and acid-treated cassava biomass. The high percentage desorption suggests that protons play a major role in metal ion desorption (Periasamy and Namasivayam, 1994; Vijayaraghavan et al., 2004). Similar results have been reported for several studies in the literature (Klimmek et al., 2001; Zhou et al., 1998; Al-Asheh and Duvnjak, 1999; Marshall and Johns, 1996). They all reported over 90% desorption of metal ions from unmodified and various chemically-modified biomaterials. The adsorbents, sugarcane (Saccharum spp.) fibre and chelex (a synthetic adsorbent) were effective for binding Zn2+ from standard aqueous solutions and industrial effluents. Comparative assessment of shaken and unshaken experiments revealed that shaking enhanced percentage adsorption for both sugarcane biomass and chelex. Results of regression analyses suggest that percentage ash, CEC, particle size and porosity are important physico-chemical parameters for metal adsorption from standard solutions. Functional groups on sugarcane biomass include: carbonyl, aldehydic, carboxylic, carboxylate and hydroxyl groups. The biomass is a better adsorbent for Zn2+ in effluents since it has greater potential for removal than chelex. It also has an added advantage of being biodegradable; hence, disposal will be relatively easier. The process will be environment-friendly since the metals so removed may be recovered for re-use. The authors wish to acknowledge the financial support of the International Foundation for Science (IFS), Sweden, through Research Grant No. W/4264-1 awarded to Dr Opeolu. The support and encouragement of the Federal University of Agriculture, Abeokuta, Nigeria, is also appreciated. Received 3 September 2010; accepted in revised form 21 April 2011.